It's the 3rd day of 2011 and I have made some wonderful goals for this year. I hope you have too! 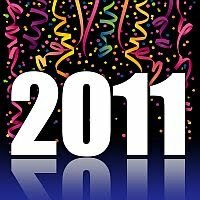 But firstly, I would just like to take a moment to reflect on 2010 - it was an amazing year for me. My business and my passion, Essential Oil Goddess was in its second full-time year in 2010. I have met some wonderful people (and horses) along the way who have changed my life forever. I have been to places I never dreamed of. I expanded my business to include my love for horses and I volunteered to help them too. I learnt advanced information and experienced essential oil farms that strengthened my commitment about sharing Young Living Essential Oils with everyone who wants to change their lives too! I am grateful for the five amazing trips I have had all around the world. In 2010 I have been on two Australian and three overseas trips with full corporate sponsorship. My husband came with me on two of the overseas trips, also at their expense. I went to O'Reilly's Rainforest Retreat in Queensland for a 3 day leader's retreat; Another leader's retreat in Darwin, Northern Territory which included a trip to the blue cypress plantation which is wildcrafted sustainably to produce blue cypress essential oil; I went to a leader's event in Idaho, USA and met some amzing mentors and people who are lifetime friends now; my husband and I went on a Mediterranean cruise, visiting Italy, Greece and Turkey; my husband also came with me to the Cook Islands vacation. I am grateful for the trip to Salt Lake City, Utah, USA to the Young Living Essential Oils Convention. This was 4 days of learning, meeting new friedns, connecting with old friends and being at the heart of my passion. The trip included a visit to the Lavender farm in Utah, which enable me to see first hand why these essential oils are so special. I heard Gary Young and his team of doctors and scientists, present research and information about frankincense and cancer. Learning this information has alllowed me to help more people (and animals) than I could ever imagine. Thank you, thank you, thank you! I am grateful I met a woman called Zoe - A Horse Specialist. With Zoe's expertise with horses and knowledge of essential oils (and my love for horses) we have been able to introduce essential oils for natural animal care into the horse world. We are just at the beginning of our journey! Watch this space! I also encourage you to connect with Zoe if you are a horse person and interested in natural health for horses. I am grateful for Charlie's Angels Horse Rescue and Amanda Vella's SAHA Horse Rescue and Sanctuary. I made contact with both these not-for-profit associations after deciding I wanted to give something back to the horses and the people who rescue them. When I can, I have been spending time with the horses, applying essential oils and adapting techniques such as the Raindrop Technique to help support the horses most in need. The rescue horses have taught me so much. I love them and want to spend even more time with the rescue horses in 2011. I know 2011 is going to be an awesome year. There is more to learn, more to share and more to give. Essential oils have truly changed my life to allow me to be the person I dreamed of being. It is such a simple change to purity and potency, which permeates every other part of my life. My new motto is Bold, Beautiful and Simple. That is all there is to it! I was listening Gary Young on CD just this morning! Would have loved to have seen him in person. Great post Jen. Wow, you've really achieved a lot over the past year. I see 2011 is going to be wonderful for you and your business. That raindrop technique sounds heavenly! awesome post. I love reflecting on what your truly grateful for. whether it is an essential oil or something greater like wonderful family being grateful for what we have is just the start to a happy life. awesome article. I really love reflecting on precisely what your really grateful for. whether or not it is an essential grease or perhaps something greater like wonderful family being grateful for what we have is just the begin to a happy life. The best diffuser oils are made using best quality essential fragrance oils and organic essential oils.